If you want the quality and subsequently the results of your training to improve, as well as to boost your strength and power, you are probably already taking some creatine monohydrate. This supplement is one of the most researched ones on the shelves right now and it can pack on muscle mass incredibly quickly. There is a lot of debate on how it should be consumed, but a lot of people including some fitness experts think that you need to have a loading phase which will help with making the best out of what you have and getting the most gains. However, a lot of people disagree with this, so today we’re looking at the science behind the supplement. Your body creates about a gram of creatine every day, and if you eat a lot of meat and fish, that will add an additional gram. In order to be utilized by your body, creatine is degraded into creatinine at almost two grams every day. Seeing as your body breaks down as much creatine as it creates and consumes, supplementing is a good way to boost the amount of stored creatine in your system. 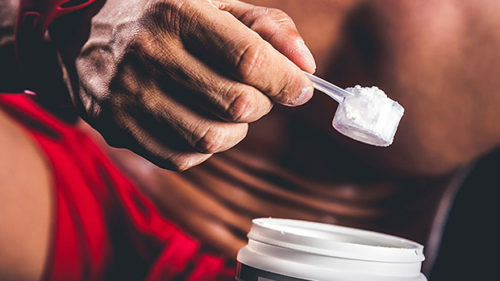 It doesn’t matter if you’re loading or you’re using small doses – creatine will boost your resting levels by 17 to 20 percent, but your consumption method will determine how quickly this boost comes. Creatine loading is when you take one larger dose of the stuff and then taking smaller amounts in the following week. So, if you take 20 grams of creatine on the first day, divided into four doses of 5 grams each, you should take 3-5 grams every following day until the time comes to load again. This means that the amount of creatine in your muscles will be increased dramatically, and due to the maintaining doses, it will stay full no matter how much you exercise. However, there are studies that show doses of 3-5 grams of creatine daily, without the first loading day, produce a good increase in muscle creatine after only 28 days. 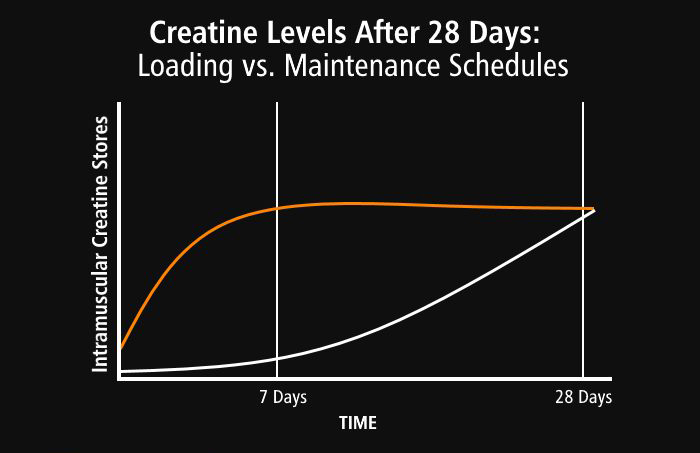 If you load, you can boost your creatine stores quickly, but after 28 days, the difference between the two methods of consumption is negligible. You should know that your muscles have a very limited creatine storage capacity, which means that when you take your loading dose of 20 grams, it takes only a couple of days to fill up your muscle storage. When you get to day three after loading, more than 60 percent of the creatine you ingest will go to your urinary tract and outside of your body. Make sure that you know this fact as to not go into excess and waste your supplement. All in all, loading is entirely your decision, and should be in accordance with your goals. If you load, you’ll have the benefits of creatine much faster, and if you’re a lifter, you might want to have a loading phase to quickly increase your strength, size and power. Know that after about a month, there is no difference if you’re loading or not – your muscle creatine stores are full none the less, without regard to your previous steps. If you have a competition coming up, load up, but if you don’t, there is no reason to waste your creatine. If you’re a weight-class athlete, loading may increase your body weight quickly because creatine will make you retain more water, which is surely undesirable. You might get a small morale boost since it will make you feel bigger, but know that the increase is just water. Also, you might have some gastrointestinal discomfort when you load since there will be a lot of water in your system. Don’t worry though – all you need to avoid this is to consume a lower dose of creatine! Remember – taking it slow and loading have the same results after only 28 days, so use whichever technique works! Chilibeck, P. D., Chrusci-Ll, M. J., Chadi, K., Davison, K. S., & Burke, D. G. (2005). Creatine monohydrate and resistance training increase bone mineral content and density in older men. Hultman, E., Soderlund, K., Timmons, J. A., Cederblad, G., & Greenhaff, P. L. (1996). Muscle creatine loading in men. Persky, A. M., Brazeau, G. A., & Hochhaus, G. (2003). Pharmacokinetics of the dietary supplement creatine.